Firstly, you will need a BMX bike. It doesn’t have to be a mega-expensive, top-of-the-line model; just an ordinary BMX of sound construction will be fine. Any pegs, lights, reflectors, stands, mudguards, or protruding items of equipment on the bike will have to be taken off for safety reasons. Before you race for the first time, come along to one of our practice night sessions, which are held at the Norwich track on Wednesday evenings (or Saturday lunchtimes during the winter season). There we will show you around the track and answer any questions that you might have. Your first race will be either a local or regional event. You will be racing in a class of riders of your own age and ability, and your main goal of this race will be to learn how a race is run and to have fun! For upcoming race dates, visit our events page. So now you’ve raced at your first event, and the BMX bug has gotten hold of you, where do you go from here? Well, the only cure is more racing. As well as local races and club days, there is a regional series that runs through both the winter and summer and, when you are feeling confident enough, there is a national series that runs throughout the summer. 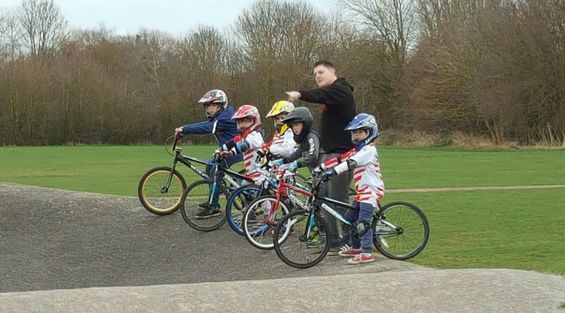 in Norwich, Norfolk, for further information about your first race at our BMX club.